Great photographs are made by photographers who know how to combine interesting subjects with the right photographic gear, the right settings, and most importantly an artistic eye. If you are using your digital SLR only in the green auto mode you are essentially turning your camera into a basic point-and-shoot and not using it to anywhere near its full potential. Only using the green auto mode seriously limits your capability to create the types of beautiful images digital SLR cameras were designed to capture. 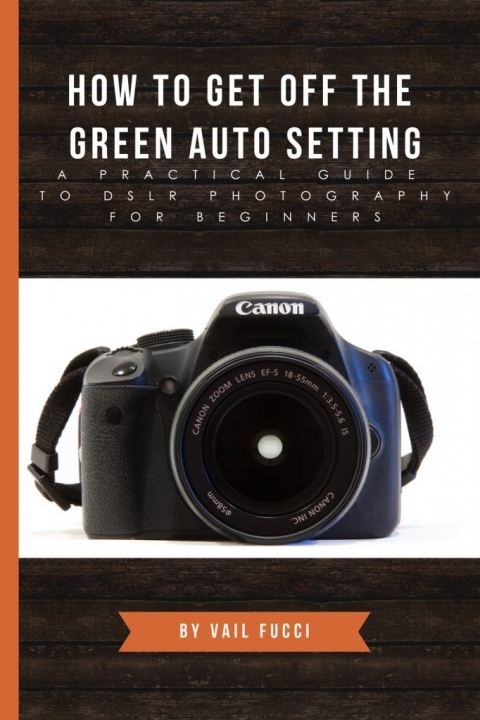 With Vail Fucci's introduction to photography book, How to Get Off the Green Auto Setting: A Practical Guide To DSLR Photography for Beginners, and the videos found on this site your eyes will be opened to a whole new world of photographic possibilities. It is not intended to be a definitive text on all things digital photography. Rather it contains the same practical lessons that Vail regularly teaches her photography students that will provide you with the information and skills necessary for you to feel confident enough to take off the training wheels that are the green auto settings. You'll learn the basics of digital photography, how to best use the preset modes on your camera, how and when to use shutter priority mode and aperture priority mode, and will even graduate to using the manual settings. Once you do this you can start to use your digital SLR as it was intended: as a magnificent photographic tool.